These mini muffins provide a touch of sweet and savoury all in one bite. Made with Granny Smith apples and light cheddar cheese, these bite-size muffins are perfect for packed lunches and after-school snacking. Combine bran and milk in large bowl; let stand 5 min. Meanwhile, mix flour, baking powder, baking soda and salt. Add brown sugar replacement, oil and egg to bran mixture; mix well. Stir in dry ingredients just until moistened. Add apples and cheese; stir just until blended. Spoon into mini muffin tins sprayed with cooking spray. Bake 12 to 14 min. or until toothpick inserted in centres comes out clean. Cool in pan 10 min. Remove to wire racks; cool completely. 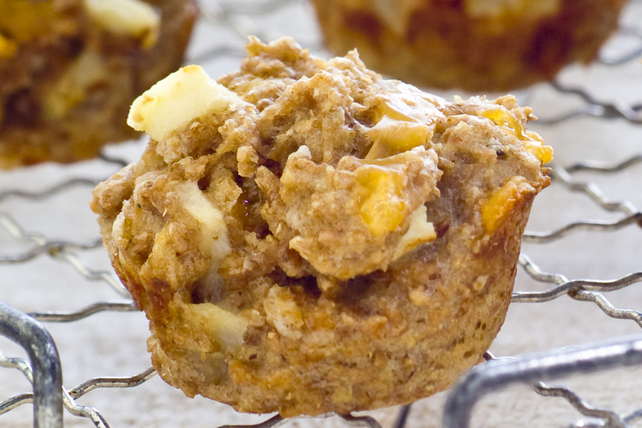 For more flavour and colour, add 1/4 cup chopped dried cranberries to muffin batter with the apples and cheese. Prepare using other baking apples, such as Spy or Cortland. McIntosh apples are great eating apples but tend to fall apart and not hold their shape with baking. Help your friends and family eat right with these delicious muffins that are prepared with better-for-you products.